Commercial property owners typically begin a strong push for site improvement as winter ends and the weather permits spring construction. 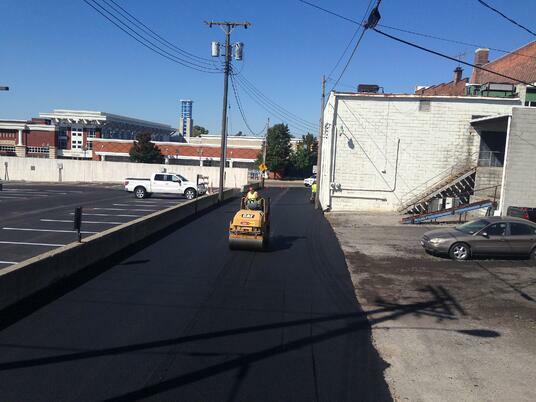 You may be looking to repair damage to your asphalt parking lot after a harsh winter. Or perhaps you see this spring as an ideal time to upgrade your stone parking lot into an attractive asphalt lot. Either way, here are some great parking lot design tips to consider as the weather in Central OH breaks. The asphalt plants here in Central OH open around mid-April. If you’re planning an asphalt parking lot where you’ve never had one before, now would be a great time to set your plans in motion. The sooner you can get on a paver’s schedule, the more quickly (and cheaply) your parking lot will be addressed. If you wait until summer to begin planning, you could pay more for the upgrade and/or potentially have wait until next year. The strength of your subgrade will make or break the health of your asphalt parking lot for years to come. An uneven, unsupportive foundation will quickly erode a lot’s stability from below. It may be necessary to dig deep, at first, in order to rebuild and precision roll the subgrade to be more flat and sturdy. Do a proof roll (which involves driving a fully loaded dump truck over the foundation) to uncover any weak spots or other trouble areas. Your contractor can stabilize weak spots or areas of pumping mud by introducing an easily compactable construction aggregate stone grade like #304 or #411. Then, of course, rolling and compacting the subgrade properly should provide the support the asphalt needs. This should eliminate high and low areas that create weak, uneven asphalt. We see this often on aging stone parking lots: Grassy or landscaped areas surrounding the lot have begun encroaching to the interior. These areas must be ripped up and squared off for an attractive, functional asphalt parking lot. Not only will a parking lot design 100 feet wide on one side and 110 feet wide on the other appear noticeably sloppy and unprofessional, but it could also cause unforeseen maintenance issues in the future. An asphalt parking lot that regularly holds light-duty traffic from, let’s say, shoppers in mid-sized sedans will undoubtedly experience less stress than one that carries tractor trailers daily. Most likely, your contractor will have an asphalt cocktail of choice. While it may work well in most instances, it may not be sturdy enough for your needs. Discuss this with your contractor to agree on the proper asphalt mix to suit the job. Water is a killer. Left standing, water will seep down through porous asphalt and slowly (but surely) erode the subsurface. In winter, water will create and expand cracks as it expands and contracts with the freeze-thaw cycle. Would it be best to strategically place stormwater catch basins? Or should your lot be slanted slightly to allow water to slide into a nearby ditch? Discuss the best plan with your contractor based on your location and its stormwater infrastructure. Whether you’re repaving an old asphalt lot or upgrading from stone, there are many considerations to ensure the best possible parking lot to service your business or organization. Do your homework and be proactive this spring construction season. Work with an experienced contractor to develop a strong asphalt parking lot design and installation plan.